Blend is an upgrade to our OKTOPUS software that allows you to engage, motivate, and assess every student, using any resource, both inside and outside the classroom. Users can organize, present or assign assessments, collaborate with students and record learning at every step of the way. Ready-to-teach, grade-level math, reading and science lessons can be used in the classroom or at home. Additionally, users can author their own lessons for students to access at anytime. Lessons and assessments are instantly graded and all results are stored in the cloud. 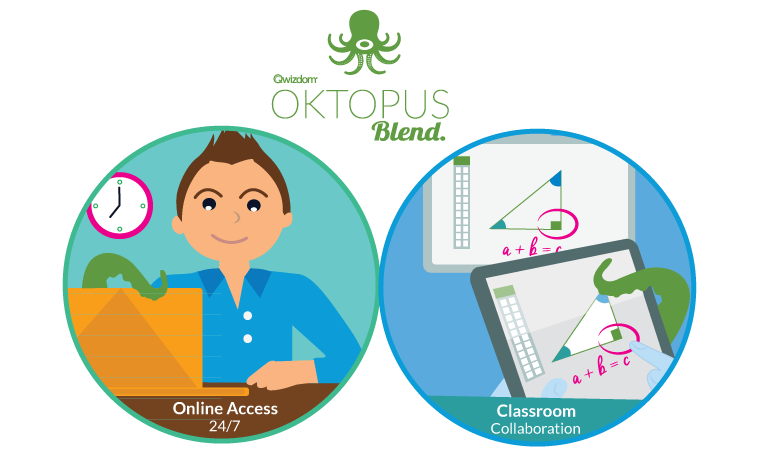 OKTOPUS Blend, a complete blended learning solution that provides access to premium content, classroom collaboration, online self-paced learning, online content organization and reporting. Download and play content in the classroom using OKTOPUS software and the Qwizdom Notes+ collaboration app. Connect 40 student devices to a live OKTOPUS lesson and use OKTOPUS’s annotation tools to illustrate concepts. Students follow along on their personal devices, taking notes, answering questions and sharing annotation over the live session. Students can download the app from Google Play or the Apple App Store for free, a classroom license is included with purchase. Create, manage and store all course materials in one central location. OKTOPUS Blend gives you the ability to author courses by allowing you add YouTube Videos, PowerPoint presentations, PDFs, and other web documents. Drag and drop features allow you to quickly find, organize and access materials.